Facial Rejuvenation is a non-surgical treatment method that uses Acupuncture to reduce the signs of aging. What sets Facial Rejuvenation apart from similar methods is that it doesn’t just treat facial appearance. 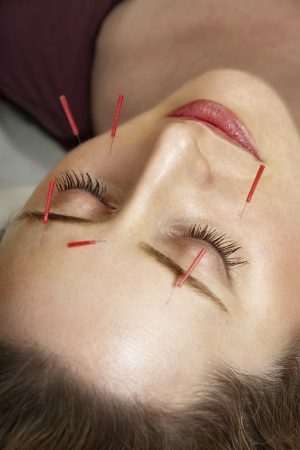 During the treatment, you can experience many benefits that Acupuncture offers. Because it is based on the principles that have allowed acupuncturists to treat diseases for thousands of years, this technique enables us to gently change the patterns that have contributed to the signs and symptoms of aging in the entire body. With this approach, signs of aging can be diminished and healthier aging can be established. As treatments progress, you will not only look better but feel better and revitalized. The whole treatment can be done in an hour and a half, in a relaxed and welcoming environment. The needles used are very thin, making the process painless. They are inserted in various places on the face, neck, ears and rest of the body. Aesthetically some of the benefits include reduced bags under the eyes, firmed jowls, erased or diminished fine lines and wrinkles, reduced puffiness, minimized double chins and much more. Facial Rejuvenation has been shown to reduce from 5 to 15 years off of the face with noticed benefits in as little as a few treatments. Deeper than this, the body is also healing allowing for a more complete and therapeutic treatment. The beauty of Facial Rejuvenation is that it not only treats the outside but the inside as well, allowing the treatment effects to last longer while feeling great. Whether you are looking for reduced signs of aging or you want to promote graceful aging, you cannot truly look and feel better until you promote healing on every level. To learn more about Facial Rejuvenation and if it is right for you, call to set up a free 15-minute consult. We look forward to working with you and setting up individualized treatment plans that address all of your health concerns.